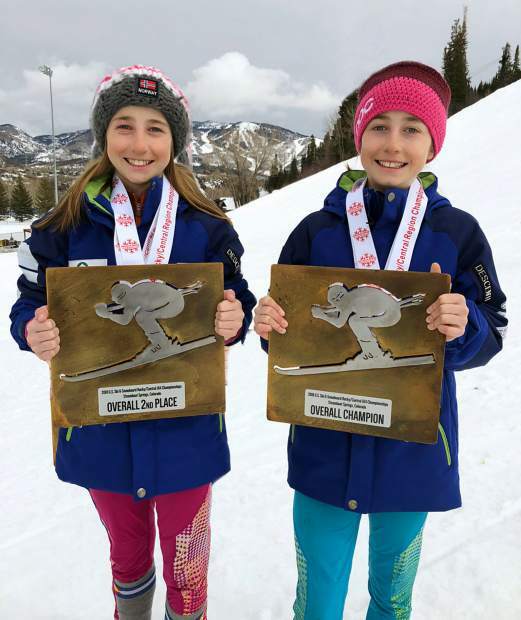 Twin sisters Kjersti Moritz, left, and Liv Moritz, right,both of Ski & Snowboard Club Vail, were separated by a mere five points in the overall standings at the U14 alpine championships in Steamboat Springs. Ski & Snowboard Club Vail skiers dominated the podium throughout the weekend at the Rocky/Central U14 alpine championships at Howelsen Hill in Steamboat Springs. Individual victories included Zoie Plamer in the super-G, Kjersti Moritz winning a pair of giant slaloms, Tianna Bruce winning slalom and duals, and Liv Moritz with a slalom win. On the boys’ side, Nick Kirwood snagged a GS win, while Seb Kohlhofer picked up victories in slalom and GS. Other podiums performances included Toby Scarpella and Hunter Roach, in addition to several more by the aforementioned winners. After tying in Friday, March 16’s GS, SSCV’s Liv and Kjersti Moritz, identical twin sisters, were separated by a mere five points (485-480) in the overall standings. They finished first and second, respectively, followed by Tianna Bruce with 410 points. SSCV girls swept the top six overall. In the boys’ overall, SSCV’s Kohlhofer, Kirwood and Scarpella finished in first, second and third, respectively. Move-up awards included the following: Avery Forstl started 73rd and finished 20th in the slalom; Ava Crowley started 91st and finished 43rd in the GS; Tegan Sharfstein started in the 80s and finished 23rd in the duals; Sawyer Reed started 96th and finished 28th in the slalom; Spencer Peterson started 90th and finished 15th in the duals. Of these U14 athletes, SSCV qualified three girls and one boy to U16 alpine national championships: Liv and Kjersti Moritz, Palmer and Kohlhofer. Can-Am qualifiers include Bruce, Kaitlin Keane, Scarpella and Kirwood. SSCV’s U12 alpine skiers made their way to Keystone for the regional championships over the weekend. The races were originally scheduled for Powderhorn but were moved due to lack of snow. SSCV’s Andrew Gunther was the star performer of the weekend winning three of the four races (two GS, one slalom). Meanwhile, U10 racer Jackson Leever skied up to the U12 age group and scored impressive results: second- and third-place finishes in GS and slalom, respectively. Ricky Shay and Tyler Hopkins also earned podium results. On the girls’ side, Logan Hale snagged a trio of podiums, including two second-place finishes across both disciplines. She was joined by Ashley Anderson, who registered a win in slalom, and Isa Gonzalez, who took second in the same race. Throughout the weekend, SSCV landed between three and five athletes in the top 10. The club occupied half of the top 10 in four of eight races.